Where the Rivers Meet is a regional programof Weaving Bonds Across Bordersto empower youth of the Mekong and Salween regions to take leadership roles on issues related with peacebuilding, community participation and water management both within communities and across borders. 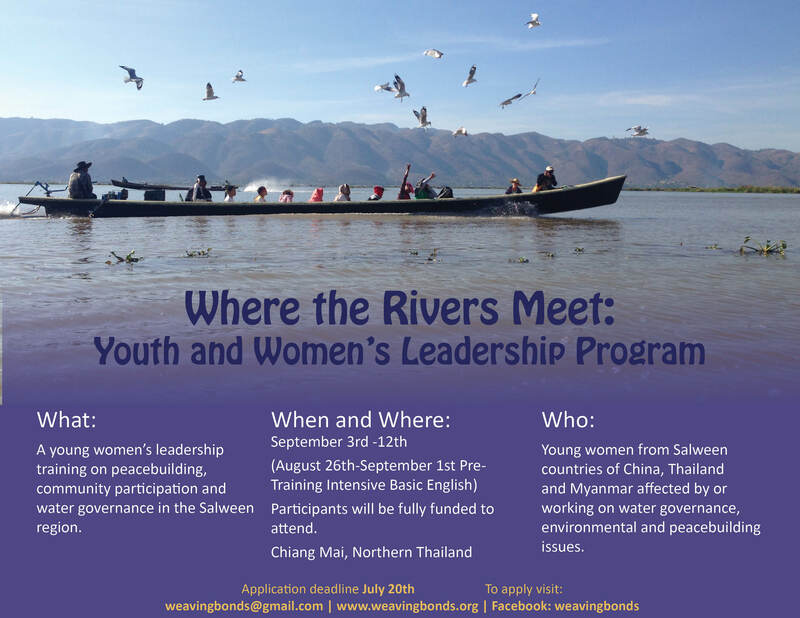 Our Youth and Women’s Leadership Program (YLP) will bring young women from the Salween region countries to learn peacebuilding, leadership and community participation skills through a training, leadership development and networking program. Through this project, we will build the leadership skills of young women to support their communities and alsosupport friendship and network building between the Salween region of Thailand, Myanmar and China. Young women from local communities, CSOs, or NGOs in Salween countries of China, Thailand and Myanmar, particularly those affected by or working on issues related with water management, environmental and peacebuilding. Interest and enthusiasm for peacebuilding, environmental protection and community participation. Participants’ costs of travel to/from Chiang Mai, Thai visa, accommodation and meals during the training will be funded. The deadline to apply is July 20th. For more details, see application form below.